C-Trak has installed a Conveyor Index for you to be able to understand the basic terminology that is used within the conveyor industry. Accessibility: The ease of access or approach to equipment for operation, inspection, maintenance and lubrication. Accumulation Conveyor: Any conveyor designed to permit accumulation of packages, objects or carriers. May be roller, live roller or belt. Adjustable Speed Drive: A drive or power transmission mechanism that permits variation of its speed within design limits. Arc of Contact: The angular wrap (in degrees) of a belt around a pulley. Assembly Conveyor: Any type of conveyor adapeted to convey assemblies or parts through a series of progressive assembly operations. Bare Pulley: A pulley which does not have the surface of its faced covered or lagged. Bed: The part of a conveyor upon which the load or carying medium rests or slides while being conveyed. Belt Conveyor: An endless belt operating over suitable, drive, tail end and bend terminals and over belt idlers (rollers) or slider bed for handling bulk materials, packages, or objects placed directly upon the belt. Belt Scraper: A blad or blades cause to bear against the moving conveyor belt for the purpose of removing materials sticking to the conveyor belt. Belt Tracking Device: May be required to maintain proper tracking of belt. Assembly consists of Cam Rollers and “clamping” device to prevent belt return from moving off of the central path. Booster Conveyor: Any type of powered conveyor used to regain elevation lost in gravity roller or wheel conveyor lines. Brake: A device for slowing down conveyor or components for controlling overspeed du to the action of gravity. Brake Belt: A stop-feeder device for indxing, spacing, or controlling unit loads. Capacity: The number of pieces of a defined size, volume of material, or weight of material, that can be handled by a conveyor in a unit of time. Ceiling Hangers: A support fastened from an overhead frame work to position and carry loads. Chain Driven Feeder: Generally utilizes PVC smooth surface belt. It is slave driven from the inclined (or declined) unit. It can also be used in minimum elevation applications. Chain Guard: A covering for drive or conveyor chains for safety purposes. Cleat: An attachment fastened to the conveying medium to act as a support to help propel material, parts, or packages along the normal path of conveyor travel. Clutch: A device to permit engagement or disengagement of drive mechanism while in motion or at rest. Constant Speed Drive: A drive with no provision for variable speed or a drive with the characteristics necessary to maintain a constant speed. Control: The system governming the starting, stopping, direction of motion, acceleration, speed, and function of the moving member in a predetermined manner. Control Enclosure: The type of construction of the housing or case which encloses a control component. The common types of enclosures are designated by NEMA. Conveyor: A horizontal, inclined or vertical device for moving or transporting packages or objects in a path predetermined by the design of the device and having points of loading and discharge fiex or selective. Conveyor Belt: A belt used to carry materials and transmit the power required to move the load being conveyed. Crown: The rate of taper of a pulley face that is defined as the amount by which the diameter at the center of the face exceeds the diameter at the edge. Curve: A conveyor section used to change the direction of travel. Dead Load: The combined weight of the conveyor elements and supports. Dishcharge End: The end of a conveyor usually where the material is fed off the unit. Diverging Section: A section of roller or wheel conveyor which makes a connection for diverting articles from a main line to one or more branches. Diverter: A mechanism used to alter the path of a unit load for traffic control or sortation purposes. Also known as a deflector or plow. Double Roller Curve: Also known as differntial rollers. Uses “split roller” design to conveyo product. Conveyability of product improves with split or double roller design. Guard rails should be used. Drive: An assembly of the necessary structural, mechanical, and electrical parts which provide the motive power for a conveyor. Drive Pulley: A pulley mounted on the drive shaft that transmits power to the belt with which it is in contact. Drive Shaft: A main driving shaft on which conveyor sprockets, gears or pulleys are mounted. This shaft is connected to the drive unit through a coupling, sprocket gear or other form of mechanical power transmission. Durometer: A measure of the hardness of rubber or plastic material. Escapement: In gravity or power operated package conveyor, a device to permit the release of packages on at a time on demand. Explosion Proof: Equpment designed in accordance with existing codes and standards such that it will operate in a specified hazardous environment without causing an explosion. Extendable Conveyor: Closely fitted plates positioned between the rollers of non-powered or powered roller conveyors. Filler Plates: Closely fitted plates positioned between the rollers of non-powered or powered roller conveyor. Flexible Coupling: A mechanical connector to transmit torque without slip and to accommodate misalignment between driven machine members. 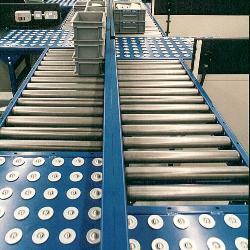 Flow Rack: A tiered structure with multiple storage compartments with conveyors as the load supporting members. Frame: The structure which supports the machinery components of a conveyor. Gap Roller: Fills the space created when driven rollers cannot be located close enough to transport product. Gap rollers are generally required on chain driven live roller conveyors to convey small products. Gate: A device or structure by means of which the flow of material may be stopped or regulated. Grade: The rate of incline or decline in terms of degrees from the horizontal. Guard: A covering or barricade for safety purposes such as gear, chain and nip guards. Guard Rails: Members paralleling the path of a conveyor and limiting the product on the conveyor to movement in a defined path. Herringbone Roller Conveyor: A roller conveyor consisting of two parallel series rollers having both series skewed. Idler: A puley, sheave, sprocket or wheel around which a belt , cable or chain passes in changing direction of travel. Knee Brace: A structural brace at an angular position to another structural component for the purpose of providing support and/or stability of the conveyor frame. Lagging: A smooth or embossed covering or coating applied to a pulley to reduce belt slippage or wear, and prevent material build up. Lagged Pulley: A pulley having the surface of its face covered with lagging. Limit Switch: An electrical device by which the movement of a conveyor may be controlled within predetermined limits. Line Shaft Conveyor: Roller conveyor with carrying rollers individually powered by “O” rings from a rotating shaft. Live Roller Conveyor: A series of rollers over which objects are moved by the application of power to all or some of the rollers. The power transmitting medium is usually belting or a chain. 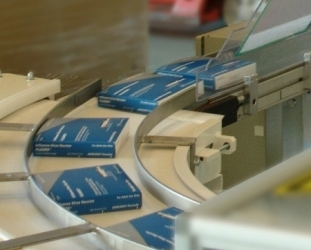 Metering Conveyor: In package handling, a short powered conveyor whose speed and motion are controlled to release unit loads at predetermined rate. Nip Point / Pinch Point: A point at which a machine element moving in line meets a rotating element in such a manner that it is possible to nip, pinch, squeeze or entrap a person or object coming into contact with one of the two members. Nose-Over: Curved or segmented frame sections having rollers properly spaced to provide a transition from incline to level or from level to decline. Power Conveyor: Any type of conveyor which requires power to move its load. Roller Conveyor: A series of rollers supported in a frame over which objects are advanced manually by gravity or power. Rough Top Belt: A belt conveyor that is intentionally made with irregular ridges or projections to produce a broken surface for greater traction or carrying abilitities. Screw Take-Up: A take-up assembly having provisions for manual adjustment by one or more screws to compensate for stretc, shrinkage or wear of a conveyoing or power transmission medium. Shaft: A bar, usually of steel and usually round to support rotating parts or to transmit power. Skatewheel Conveyor: A type of wheel conveyor making use of series of skatewheels mounted on common shafts or axles, or mounted on parallel spaced bars on individual axles. Slat Conveyor: A conveyor employing one or more endless chain to which there are non-overlapping, non-interlocking spaced slats attached. Slats may be constructed of various materials including steel and a variety of hardwoods. Slider Bed: A stationary surface on which the carrying run of the belt conveyor slides. Supports: Arrangements of members used to maintain the elveation or alignment of conveyor. Supports can take the form of ceiling hangers, floor supports, or brackets and can be either stationary or portable. Tail Pulley: A pulley mounted at the tail end of a conveyor. Take-Up: The assembly of the necessary structural and mechanical parts which provides the means to adjust the length of belts, cables, chains, etc., to compensate for stretch, shrinkage, or wear and to maintain proper tension. Tapered Roller: A conical conveyor roller for use in a curve with end and intermediate diameters proportional to their distance from the center of the curve. Tread Rollers: Rollers carrying the object or product being transported. Troughed Bed Conveyor: A belt conveyor with the conveyor belt edges elevated on the carrying run to form a trough by conforming to the shape of the troughed carrying idlers or other supporting surface. Wire Mesh Belt Conveyor: A flexible belt composed of a series of formed wires laterally connected, or of longitudinally articulated wires laterally connected for operation over straight face pulleys or sprockets.